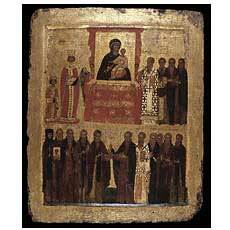 Several Times in the year the Byzantine Church prescribes periods of fasting. The least important (but most visible) aspect of this fasting is a change in the quantity and quality of food: we eat one meal a day, with no animal products. The practice of fasting comes highly recommended by the holy Fathers and Mothers and, indeed, by the word and example of our Lord Himself. It is always seen as a means of purification, usually before some significant work to be done or decision to be made. The object of this fasting is not simply self-discipline nor, certainly, girth-control (though these are useful secondary results) it is that turning of the soul to God, the re-shaping of the will, that the Greeks call Metanoia (usually translated into English as “repentance”). If one’s health allows one to observe the fast with regard to food, one should feel the need to do the best that one can, but all should fast of the spirit. In the words of St. John Chrysostom the fast is of no advantage to us unless it brings about our spiritual renewal. On the purely physical level , many healthy people are alarmed by a loss of vigor in the first three or four days of Great Lent and stop fasting, not realizing that the body needs some time to adjust to a new intake level. If a low-energy condition persists into the second week, perhaps you should consult with your physician as to what extent you can keep the fast. One of the most fundamental teachings of our Church is the unity of the human person. We are creatures composed of body, soul and spirit, but we are not separate parts just together for the moment (no ghost in a machine of Descartes), but an inseparable unity. Our various parts therefore interact at all times. The two opposite pitfalls to avoid in Lenten fasting are “phariseeism” and laxity. If one thinks like the ancient legalists, the temptation is to imagine that a perfect obedience to the fasting guidelines is an end in itself, and can save us. This is wrong. No one and nothing saves us except God, Father, Son and Holy Spirit. We dispose ourselves to divinization through our ascesis and other practices, but theosis is a free gift of God to the cosmos. If our health, work, energy levels, economics etc. demand some concessions in fasting and abstinence, so be it. On the other hand, the reaction when one realizes that he or she cannot keep the fast perfectly is often to give up all-together: “What’s the use? I can’t avoid some (whatever: meat, tuna, cheese, etc.) during Lent. I might as well just quit now. “This should not be the case. As the Western Christian writer G.K. Chesterton once quipped: “Anything worth doing, is worth doing poorly.” Children don’t learn to walk perfectly all at once. We grow in our abilities and strengths. So too with Lent. The guidelines from the canons of our Church are here to assist you, together with your spiritual father or mother, to follow the Lenten journey effectively. We do not hold fasting to be bound under sin, seeing this in the medical, rather than legal, model. Many people, because of health or life situation, must modify the strict fast, and so have Christians done very legitimately throughout history. Recall, however, that fasting from food is secondary: First fast from sin, aided by the awareness of the season that avoiding certain foods brings. Pray more regularly, and do extra works of charity, or of kindness. Fast as well as you can, and prepare for Pascha! For the fasting dates and regulations for Great Lent this year, click here.